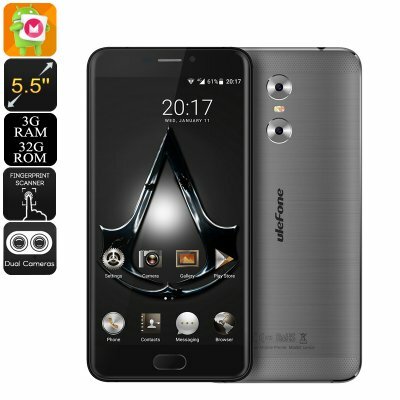 Successfully Added HK Warehouse Ulefone Gemini Android Phone - Android 6.0, 13MP Dual Camera, Quad-Core CPU, 3GB RAM, 1080p Display (Grey) to your Shopping Cart. With the Ulefone Gemini, professional-grade smartphone photography has just become affordable. Featuring a dual rear camera, this latest Android phone is capable of shooting absolutely stunning 13MP pictures and Full-HD video. This camera is guaranteed to capture great details, depth, and focus – a combination that will offer you all the freedom you need for truly artistic photography. Additionally, both rear cameras have been equipped with the 5-element lens, enabling you to shoot true-to-life yet vibrant pictures. No matter where you’ll be heading next, with the Ulefone Gemini in your pocket you’ll always have the means necessary to capture great pictures and video of all those special moments in life. Besides its breathtaking cameras, this powerful Android smartphone has been equipped with a sophisticated Quad-Core CPU that has been clocked at 1.5GHz. Along with 3GB of RAM, this CPU offers you all the power needed to undergo a speedy user experience – letting you enjoy mobile games, applications, and media without dropping a frame. On the 5.5 Inch display of this Chinese smartphone, you will be able to view all your favorite movies, series, and more in crisp 1080p Full-HD resolution – ensuring that you’ll always undergo a top notch media experience. Its display furthermore features Corning Gorilla Glass 3, taking away all your fears of accidentally scratching of breaking it while carrying it along during the toughest of everyday tasks. Packing a Sony 3250mAh Lithium-ion Polymer battery, this affordable Android phone provides you with up to 12 hours of continuous usage time. From now on you no longer have to worry about running out of juice as, with this epic battery, you’ll have enough power to get through multiple days of excessive smartphone usage. Whether you enjoy games and media, or simply like to make calls and browse the web – the Ulefone Gemini is sure to meet all your demands. By supporting up to 256GB of external memory, you can be sure that there always be some space left available for you to store your latest files and media alike. With its Dual-IMEI numbers and 4G support, this Android smartphone takes your connectivity to the next level. Enjoy the fastest mobile data speeds nearly anywhere you go and be reachable on two phone number simultaneously – with the Ulefone Gemini you’ll always be connected. Android 6.0 furthermore delivers a smooth user experience that comes packed with all the latest feature smarphone users are familiar with. With its powerful hardware and sophisticated software alike, this latest Android phone is capable of handling whatever you throw at it and is guaranteed to put a smile on your face.